Ahh… The wind in my hair, the cool breeze blowing in my face... I was the first female to attempt to fly over the Pacific Ocean. Do you know who I am? I am the one and only Amelia Earhart! I am a very famous female pilot. I was the first female to receive a pilot’s license. I really enjoy flying. I got four awards for flying at an altitude of 4,267 kilometres. I got three awards for flying over the Atlantic Ocean. I was born in 1897, in Atchinson, Kansas. In 1917, I helped wounded soldiers when I volunteered for the Red Cross. In 1922, I bought my first airplane because I was so interested in flying. In 1935, I flew from Hawaii to mainland United States. In 1937, I disappeared while flying en route from Lae, New Guinea, to Howland Island. My radio had static but I could still communicate. My fuel was low, and I didn’t see anywhere to land. My disappearance is a great mystery, because no one knows how I disappeared. 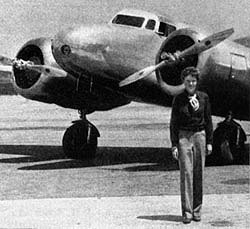 I am Amelia Earhart, and I am adventurous, because I fly all over the world. I am also heroic, because I fly during a time when flying is an unheard of pastime for women. This web page was created as part of a class project. Students created web pages about their heroes, writing in the first person voice of the hero.